NextAre Pets Allowed on Metro? In the fight over the potential impacts and priorities of the South County Connector project, the St. Louis County Department of Highways and Traffic lives up to its name. So the St. Louis County Department of Highways and Traffic wants to build its long sought South County Connector, a $110 million dollar project that would build a new road between Hanley Rd and River des Peres Blvd. Following the release of the draft environmental impact statement, the project has elicited a fair amount of criticism and condemnation from the City of Maplewood, Great Rivers Greenway, Trailnet, and St. Louis Alderman Scott Ogilvie. Great Rivers Greenway expressed some of their concerns in a recent interview on KMOX. Great Rivers sent a note of its own to the highway department, saying the Connector could neutralize $27 million in investments the organization has made to pedestrian and bike infrastructure on the River Des Peres Greenway and the Deer Creek Greenway. But [St. Louis County Department of Highways and Traffic spokesman David] Wrone pours cold water on her comment. It was a year-and-a-half ago that the County spokesman first left me speechless. As a matter of policy, we don’t build dedicated bike lanes. St. Louis County salutes the bike-riding community, but we manage our system in the knowledge that motor vehicles comprise the vast majority of our customer base. The ground and money aren’t available to provide ‘Bike Only’ travel lanes. And not long before that comment, there was the reasoning the department gave for removing Delmar Blvd through The Loop from the County’s arterial road system. Click here if you would like to sign a letter asking County Executive Charlie Dooley and Councilman Pat Dolan to withdraw the South County Connector DEIS. I hate to state the obvious, but there are no bicyclists, to speak of, in St. Louis. 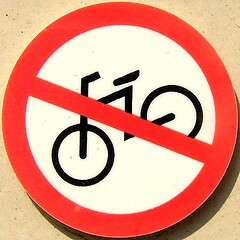 There are two VERY SMALL MINORITY groups–GRG and Trailnet–that instigate all of this bicycle nonsense. I’m a licensed and practicing civil engineer and I am simply flabbergasted as to how bicycle lanes get installed without traffic counts! The City and MODOT claim that they collaborate with GRG and Trailnet to conclude where these bicycle lanes go; they do not consult with the traveling public, police, fire, EMS, Metro, school bus companies, delivery companies, or any other entity–public or private–that relies on the roadways to get their respective jobs done. The worst part is when they take away travel lanes for bicycle lanes that sit vacant all of the time. South Broadway, Machester, Chippewa, and Morganford are all roads that experienced the so-called “lane diets” that snarl traffic for bicycle lanes that don’t get used. What about the winter time? I haven’t seen ONE bicyclist in MONTHS. I suspect that there are bribes going to “elected officials” from GRG and Trailnet as one with any common sense would not install a facility without demand. I just want to add that bicyclists are not required to license themselves or their bicycles, to insure themselves or their bicycles, to pay yearly property tax on their bicycles, and they’re also not required to undergo bi-yearly safety inspections for their bicycles–all items that cost time and money to motorists. Where is the dedicated lane for cars/light trucks and SUVs? We actually use the roads everyday, you know. Are Pets Allowed on Metro?